Rapeseed oil-based food supplement with 5 microbiotic strains in the dose of 2 billion bacteria and vitamin D3. Lactibiane Enfant drops is a food supplement consisting of rapeseed oil, 5 microbiotic strains in the dose of 2 billion bacteria and vitamin D3. Vitamin D3 contributes to normal growth and bone development in children. 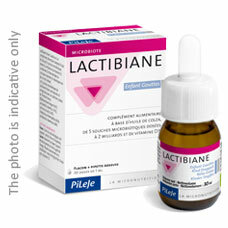 Microbiotic strains in Lactibiane Enfant drops selectively bred by PiLeJe are registered in the National Collection of Microorganism Cultures (CNCM). Before the first use, pour the contents of the sachet into the vial with oil. Close the vial with the stopper and agitate before use. After blending, store for up to 1 month at room temperature. Agitate the vial before every use. Using the measuring dropper, administer 1 mL daily (2 doses of 0.5 mL) in a spoon. May be diluted in a cold or warm drink. Duration of use: 30 days recurrently. Seek the advice of a health professional before taking this food supplement. This food supplement is not a substitute for diverse balanced nutrition and a healthy lifestyle. Use-by date and batch number are indicated on the bottom of the carton. Do not exceed the recommended daily dose. Keep out of reach of children. Vial: organic rapeseed oil, antioxidant: tocopherol-rich extract. Sachet: lactic ferments (carrier: potato starch), bulking agent: potato starch, emulsifier: mono-, di- and triglycerides of fatty acids, vitamin D3.